I wrote to Jackson County, Alabama asking for an 1878 marriage record. I couldn't find their copying fees so I said let me know and also included a SASE. (I am still working on the etiquette of these things.) 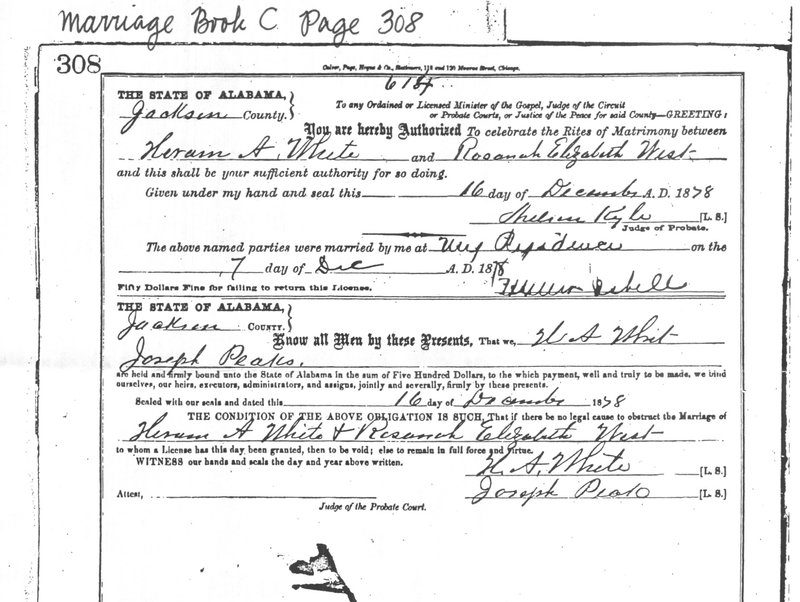 The record was indeed provided and may have a clue on who Rosanah Elizabeth West is-- a man by the name of Joseph Peaks put up her marriage bond. Brother-in-law? Uncle? I do not know at this point but up till now, Rhoda has been a dead end. An amusing thing to me, is that in addition to the photocopy of the marriage record, my original inquiry was returned as well- with the amount due actually *typed* on the bottom. Saving paper? You go, Lana! Thank you again to all the archivists, media specialists, librarians, and court clerks who help us stumbling family historians wade into your world. and this shall be your sufficient authority for so doing. ourselves, our heirs, our executors, administrators, and assigns, jointly and severally, firmly by these presents. to whom a License has this day been granted, then to be void; else remain in full force and virtue. WITNESS our hands and scals the day and year above written.